That’s the national image of Black Friday (and, with the change in store’s door-opening hours, Black Thanksgiving Evening). Area small-town retailers would like shoppers to consider another option: Skip the crowds, and stay home for good deals that help the local community. Bill Meyer, owner of Meyer Hardware in Britton, S.D., said Black Friday is an important day for the business. Clark, S.D., merchants had something else to offer: Small Town Saturday, when shoppers are enticed with deals to do their business locally on the day after Black Friday. 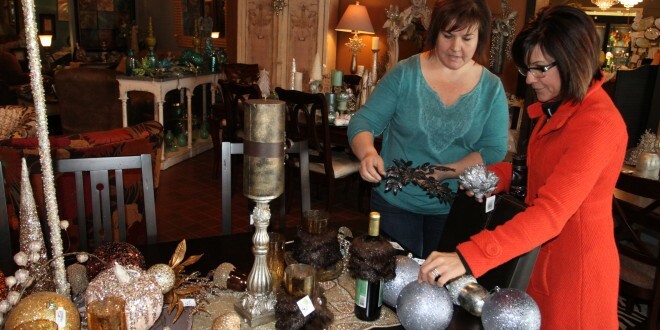 Britton follows up its Black Friday offerings with Shop Britton Nights on Mondays in December until Christmas, when stores stay open into the evening. Chambers of commerce in small towns including Kulm, N.D.; Britton and Clark offer local currency (called, for example, “Britton Bucks” or “Clark Bucks”) that encourages local spending. These “bucks” are given away in drawings but can also be purchased and given as gift certificates to be spent at local retailers. Open houses with seasonal food and drink are another common effort among retailers to get shoppers to come into their stores. All of these strategies point to the fact that a relatively modest increase in residents’ local shopping can make a huge difference for these local businesses. Patience Pickner, owner of The Picket Fence and The Other Side of the Fence in downtown Chamberlain, S.D., said she’s pleased to see more awareness for buying locally this Christmas on social media, especially Facebook. Small businesses competing for Christmas shoppers generally face two challenges: Offering the same prices as the big stores, and offering similar selection. Prices are often (though not always) lower at chain stores. Whether that means savings overall, however, depends on the distance to the store, the price of gas, and whether a shopper is able to refrain from the temptation to buy more than needed because the price is low. The Kulm Economic Development Corporation tries to inform or remind the community about the effect of their shopping decisions on the community during its annual “Discover Kulm Days” event. They call it “Discover Kulm” because during the promotion, which includes free advertising for Kulm businesses in the Kulm Messenger, community members can learn about services offered in the community they might not even be aware of. A shopper might consider a price difference between a local store and a chain store as an investment in the community, as the effect on the community is significantly different if a dollar is spent at a big chain store compared to if it is spent locally. One reason is what’s called the multiplier effect: No matter where you spend your money, it doesn’t stay in the till for long, as it goes to pay for a variety of needs for the business (products and employee wages, in large part) and goes toward a profit for the business owner. If that business is a chain store, more of those purchases and all of the profit go out of the community. If the business is local, much more of that money—three times as much, according to the American Independent Business Alliance—stays in the local community, as a local business makes more of its purchases locally. “Every dollar spent in Kulm remains a lot closer to Kulm than every dollar spent at WalMart,” said Kulm economic development board member Jordan Gackle. Local businesses are also more likely to give to local charities and causes, according to the Institute for Local Self-Reliance. Smaller stores also have a harder time offering the same selection as big box stores. That may not be an advantage if greater selection means more difficulty in finding what’s on the shopping list, or time wasted in deciphering the array of options. A recent survey, commissioned by American Express, showed that customers are not happy with the service they are getting. Two-thirds of those customers would be willing to pay more (up to 13 percent more) to get better service. And service is what local businesses are striving to offer. Pickner from Chamberlain also said service is a priority. Many shoppers do make an effort to buy their Christmas gifts in their own communities. Biberdorf said she makes an effort to shop locally year-round, purchasing a gift for someone when she sees the perfect fit. “The trick is remembering where you stashed it when Christmastime comes,” she said. Linda Kruthoff of Clark is another local shopper. Retailers appreciate those efforts, and say even a small amount dedicated to local shopping matters. “There is certainly a group of people that are willing to give hometown merchants a chance and at least give us a piece of their business,” Meyer from Britton said. Pickner said she’s realistic about people shopping out of town. She knows people like to go out of town to shop and make a fun day of it.